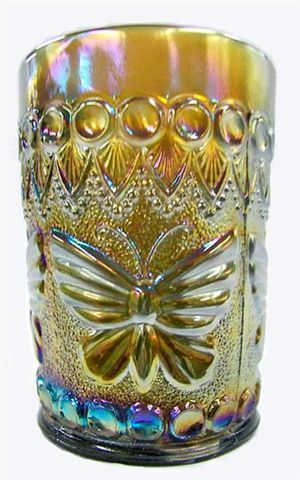 FEATHER SWIRL: is described in The Collector's Encyclopedia of Pattern Glass - page 24. 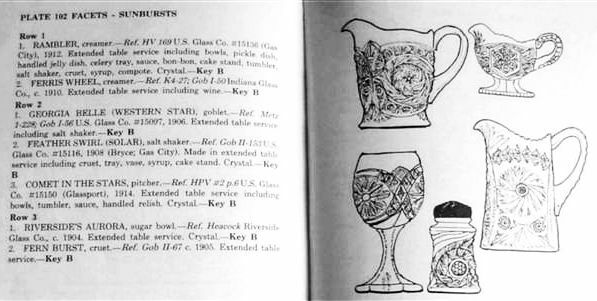 The author, Molly McCain declares it to be a product of U.S. Glass Co., (Bryce; Gas City) Pattern # 15116 - c.1908. Bryce is known to be one of the factories within the U.S. Glass Co. Conglomerate. 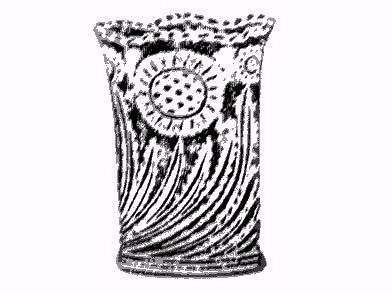 The catalog ad shown here has been found in marigold carnival glass, usually referred to as a “vase”, but with the table ware designation, we believe that shape to be a spooner. MANHATTAN Nappy: We are privileged to see this marigold nappy in the Manhattan pattern. If viewers know of others like this, we would like to hear from you. Jerry and Carol Curtis have this one in their vast collection of unusual items. Clicking on ~ ~ in our Pattern Alphabet on the homepage, you can take a look at earlier postings of rare shapes which have been found over the years by collectors who enjoy the thrill of the hunt. 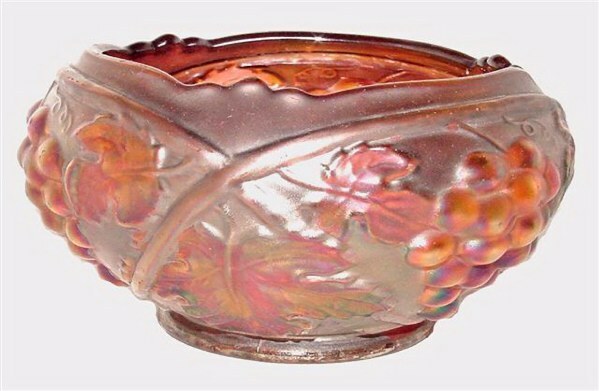 The pattern is verified as a product of the U.S. Glass Company. Sold for $6000 - Wroda Sale -1-07. BIG BUTTERFLY: Said to be one of 4 known in Olive Green. 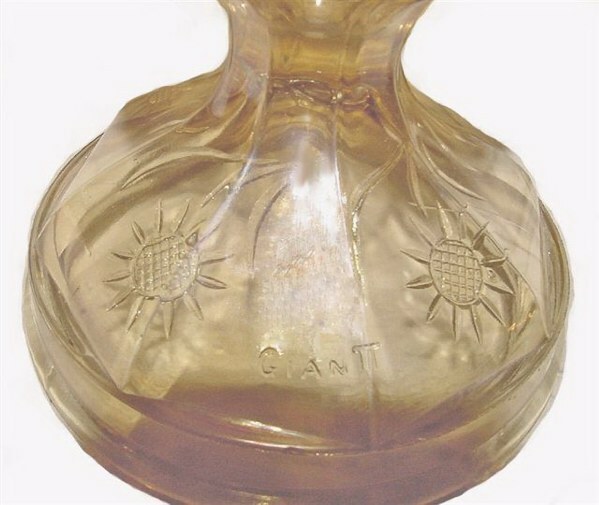 SOLAR by U.S. Glass - Tank is 5 in. diam. 8 1/8 in. high to metal wick screws. 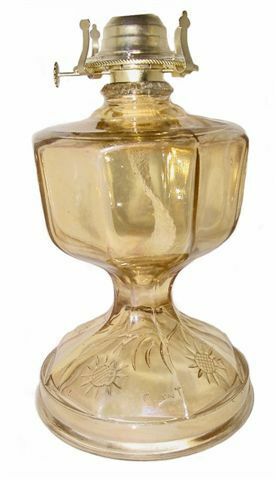 SOLAR: At this point in time, Jerry and Carol Curtis are the only known owners of this lamp, which Jerry decided to name Solar. The pattern offers some characteristics of Feather Swirl, but is not quite the same, so his name seems appropriate. COSMOS & CANE Volcano Shaped Rose Bowl - Amethyst. COSMOS & CANE Dome Ftd. Compote with sides straight up!-Honey Amber. COSMOS and CANE Whimsey from Small Berry Bowl. 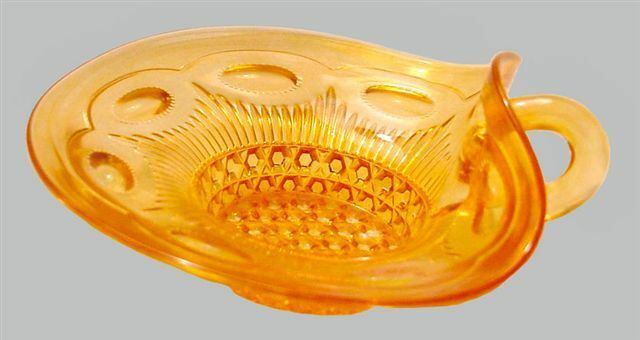 COSMOS and CANE: The whimsey shape of this small bowl in honey amber is “excuse” enough to display it for our viewers. 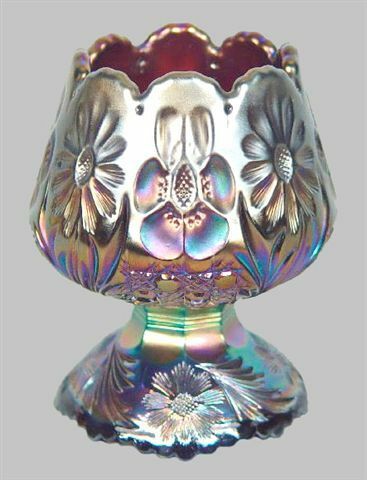 Amethyst is quite a scarce color among the shapes known in Cosmos and Cane, but we confess that this is the first time we have ever seen the amethyst base dome footed compote with marigold overlay. White, Honey Amber and Marigold are the dominant colors. 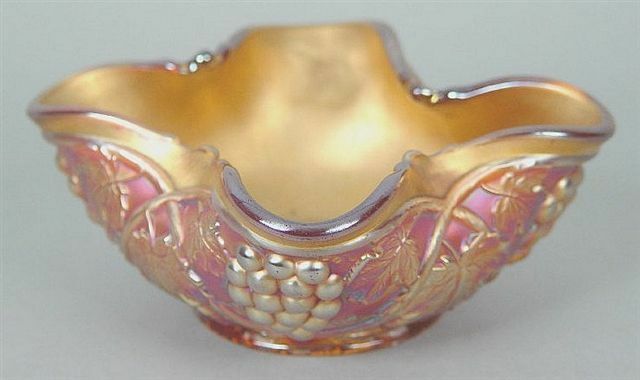 The volcano shaped rose bowl should be considered rare, both for its shape and its base color. Click on ~ ~ in our pattern alphabet to see an example in marigold. Sides straight up is yet another fantastic shape for these dome shaped compotes. A fair-size collection can be built by combining all the known variations in this pattern/shape! PALM BEACH Rose Bowl - Goofus over Clear Glass. 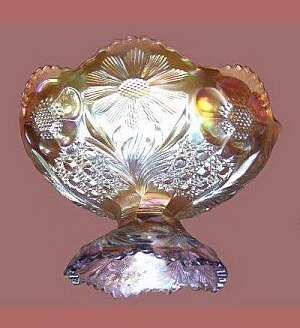 PALM BEACH Rose Bowl: Amethyst examples are known to have the Goofus trim, but Curtis' tell us this rose bowl is on clear glass. PALM BEACH 6 in. (sq) Goofus Bowl having gold interior paint. 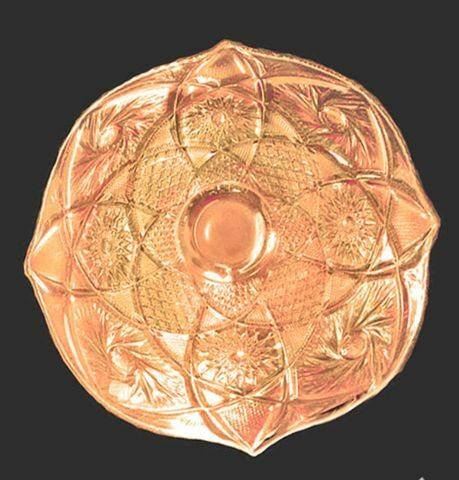 PALM BEACH Square Bowl: Gold painted interior on some pieces having Goofus treatment are seen on occasion, but cannot be considered “the norm”. Perhaps some orders were requested with the additional gold trim. 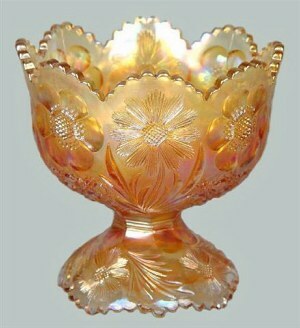 Seemingly, there are more Palm Beach small bowls having the goofus trim, than those found in marigold or honey amber. Chop Plate - 14 in. diam. WHIRLING STAR: This 14” “chop plate” was flattened from a punch bowl. Jim Seeck mentioned he had never seen another one when it appeared in their sale - March 2007. The leading question: When and by whom was this flattening performed? One first-hand report stated that the piece looked peculiar; as if the edges of the smooth surface (interior) had been re-sprayed. 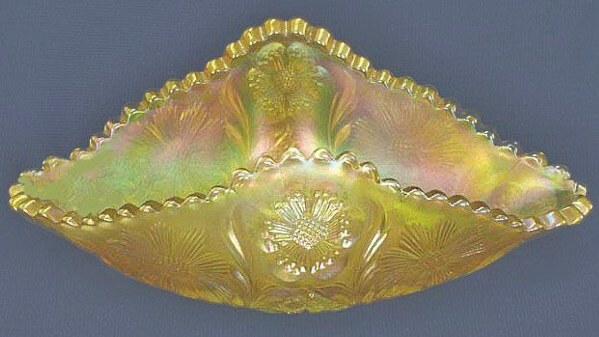 Another person reported that the “plate” appeared to be original and flattened from the punch bowl. Reportedly, the piece had come from an IL collection and the late George Loescher is said to have known of its existence some 15 years prior to his passing. If that unusual, then why should it bring only $350. and go to a couple who do a lot of selling over eBay, rather than to a true collector? A known factor in collecting plates is that in the absence of a pattern on the interior of any plate, little collector interest is aroused. The fact remains: this is a “rare-one-of-a-kind”. We must wonder over the hesitation of those in attendance who examined the “plate”? Reluctance to bid higher must have been induced by unknown detractions in appearance, creating questions over just when and how the flattening had occurred? A personal relationship with Christ begins at the moment of our salvation. Jesus referred to this event as a second birth (John 3:3). Third: We need to personally believe and receive God's Gift. No one is saved by trying to be good. We are saved by trusting in Christ. (Eph.2:8-9; also Rom. 4:5; Titus 3:5).